I am a HUGE fan of Dunkin Donuts' Iced Coffee, especially in the summertime. 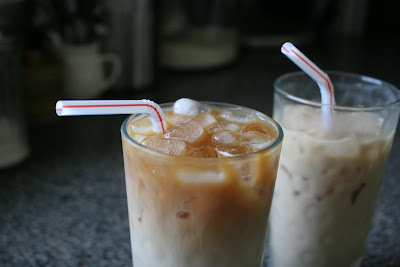 My husband is also a huge fan of their iced coffee. However, we really can't be purchasing iced coffee at DDs every time we have a craving, so I decided to start making it at home. 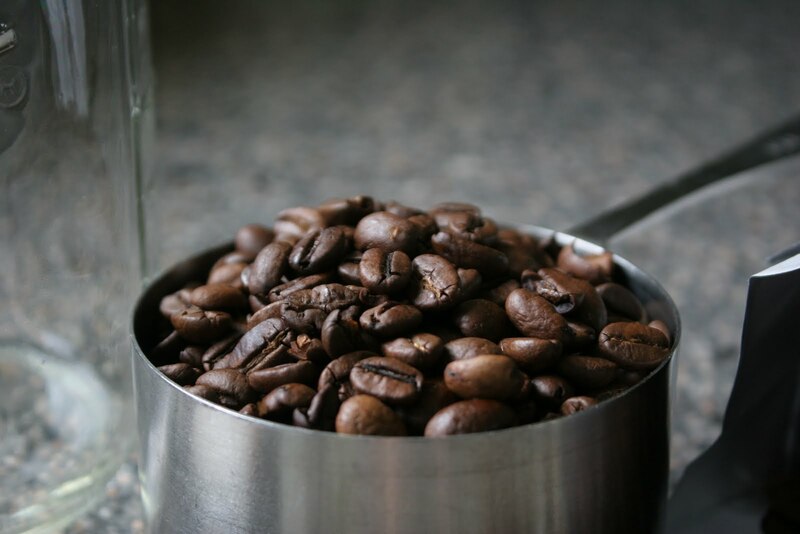 We love coffee, hot or iced, and purchase whole bean coffee that we grind at home. If you are a coffee lover, and have not joined the "whole bean" party, now is a great time. 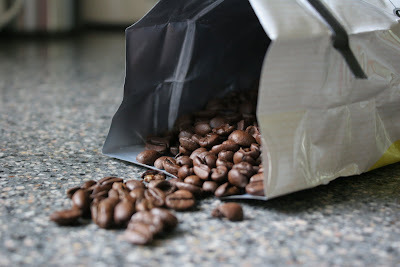 It is very affordable to buy whole bean coffee, and will bring your coffee to a whole new level of freshness and taste. 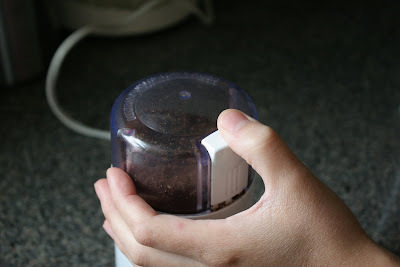 Coffee grinders are also fairly inexpensive and will last forever. If you don't have one, don't let that stop you from trying this out - use the coffee grinder at the grocery store in the coffee aisle. That is what it is there for. Let's get brewing...ha ha. Measure one cup of coffee beans. Our favorite brand of coffee is Eight O'Clock Coffee, Original Whole Bean. It was recently on sale at our local grocery store buy one get one free (and I had coupons) so I purchased a stockpile. I will be making LOTS of iced coffee with that stockpile. 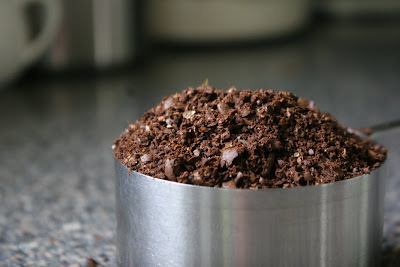 Grind the whole beans, pulsing until they are coarsely ground. That is perfect. For iced coffee, you want a coarse grind. For hot coffee, you want it much finer than this. 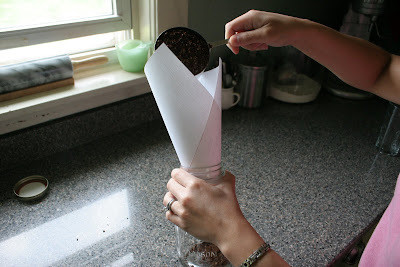 Pour into your quart size jar, using a funnel (or a piece of paper like me). Add cold, filtered water to the tippity top of the jar. Seal and place in the fridge overnight, or for 12 hours. You can see the jar on the left was the one we just filled and hasn't "brewed" overnight like the jar on the right. This is a cold brew process and will happen as it sits in the fridge. 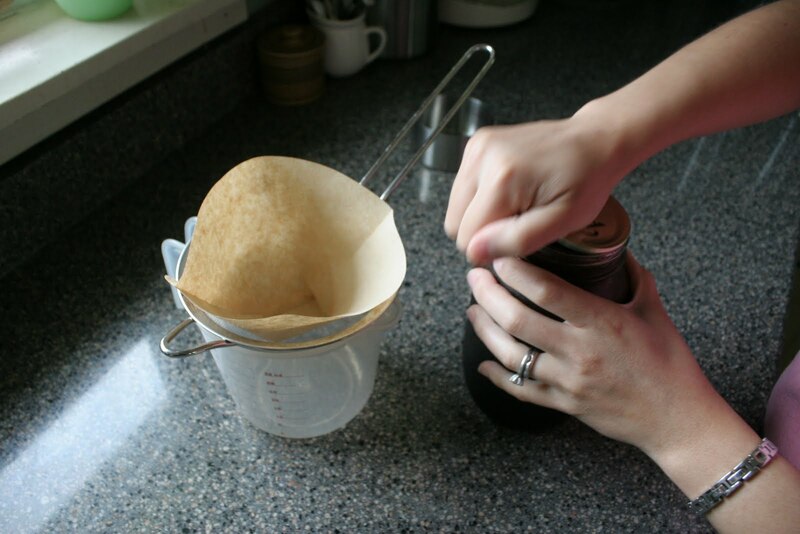 Once your long wait is over, prepare a mesh strainer by lining with a coffee filter or cheesecloth. Place over a large measuring cup or bowl. You really do need to line the strainer with something, because the beans will go through it if you don't. 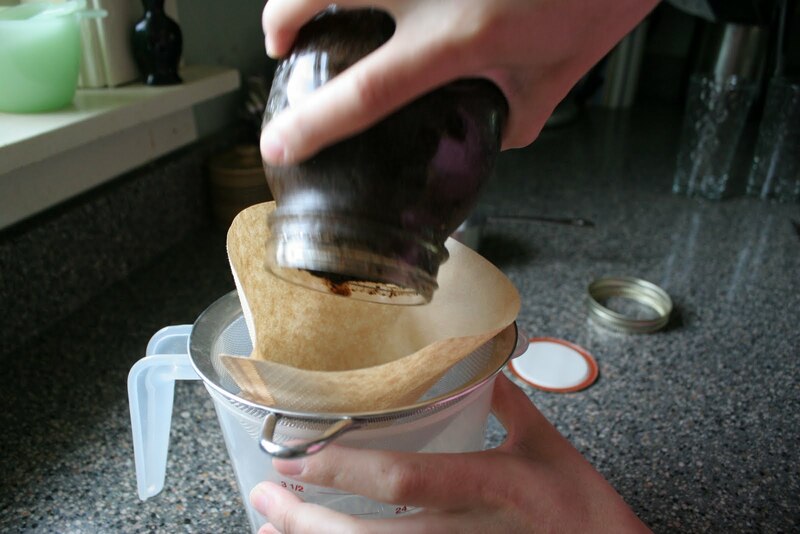 Carefully pour your brewed mixture over the strainer. 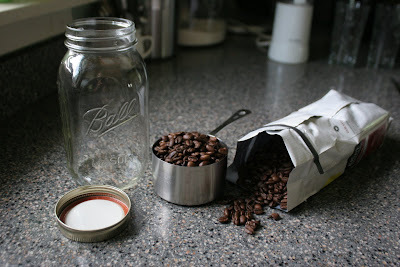 The coffee beans will all be at the top, lodging the liquid in the jar. You might want to use a spoon of something to carefully scoop out the top first. Apparently, I was not very careful. I need to take my own advice. The coffee will take a few minutes to go through the lined strainer, you might want to help it along by pushing it down through. Now you have your iced coffee concentrate. Pour over ice and add your choice of cream, half & half, or milk. Or drink it black if that is how you like it! Store the remaining iced coffee concentrate in the fridge (I rinse the jar out that it brewed in and store in the jar). So good. I like it with just a little half & half. Travis likes his with a little half & half and sugar. Don't forget a straw. It will taste better with one. Promise. 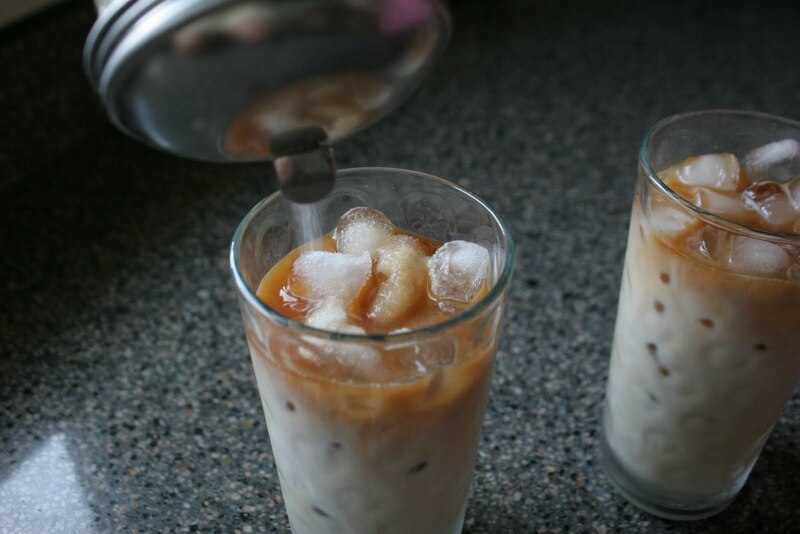 Now you know how to make perfect iced coffee. I'll be making it all summer long. And word of advice - start another jar now so you can have more iced coffee tomorrow. You will be glad you did! All pictures in this post were taken by Travis. Such a great post!! I'm a big fan of DD iced coffee too! thanks!! Thanks for showing this to me. 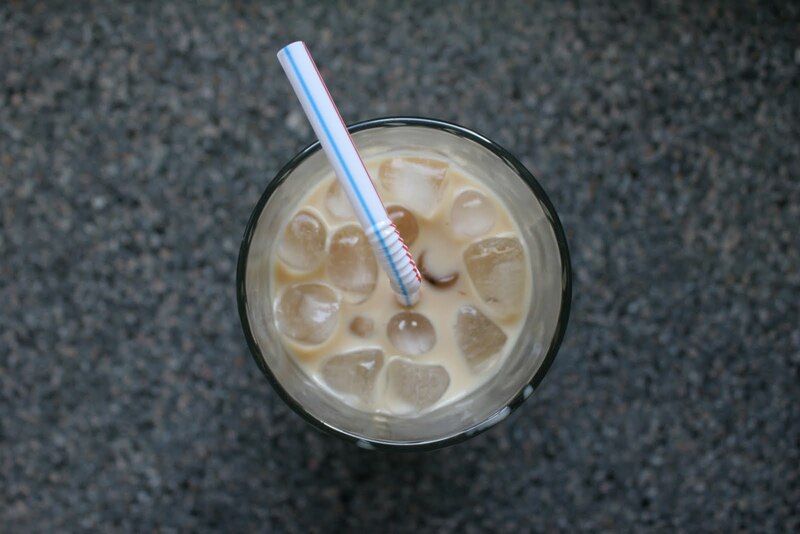 I've tried to get the perfect cup of iced coffee and it never was. We are Starbucks people here and buy the beans that we grind too. Can't wait to try this! I didn't know cold brewing was an option, but how nice to have it on hand, ready to go. 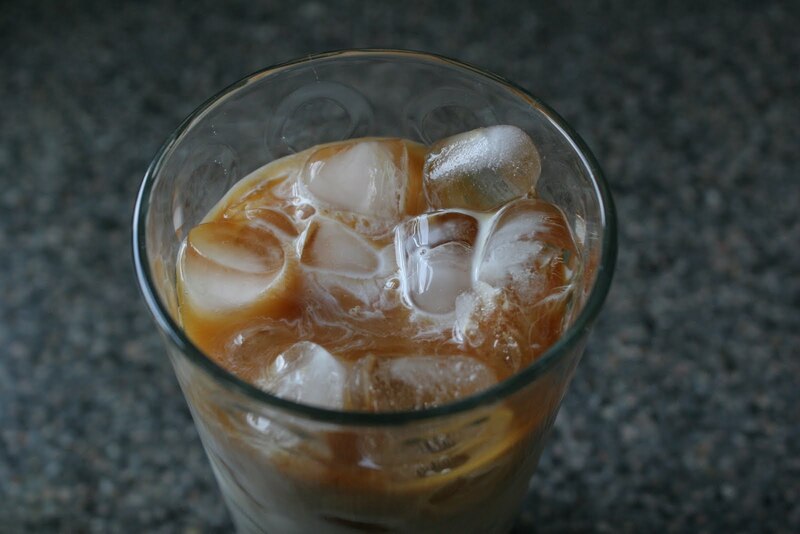 From what I have read, cold brewing gives you a less bitter and less acidic tasting iced coffee. Pretty cool! 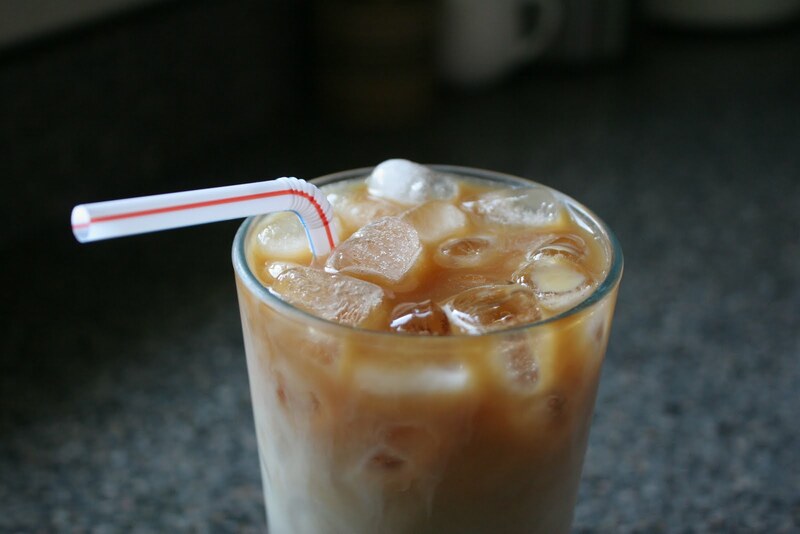 I am so glad you are all as excited as me about being able to make good iced coffee as home. 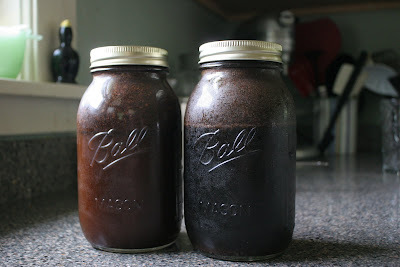 I made some vanilla sugar this week & your iced coffee. Put the two together and it was pure bliss! Thank you so much for the recipe! same recipe though, and i think it tastes better than anything you can buy. SUPER idea! I'm totally stealing it from you and will be enjoying a cup tomorrow! Thanks for the tip, I've only been brewing a pot of coffee and then putting it in a pitcher in the fridge. Cold brewing sounds much better. As a sugar free but sweet suggestion I've been using sugar free french vanilla liquid (kind of like the Star place uses. I got it at World Market. Can't wait to try it. This is so weird...last night I looked up how to make DD iced coffee (because they are delicious!) and here I am today reading your blog! It was a match made in heaven! Thanks! I work at Starbucks...An easier way to do this would be to brew a hot, double strength batch like Starbucks does, using your coffee maker. If you like your iced coffee just like Starbucks, use 4 tablespoons for every 6 ounces of water...That's double the recommended amount. 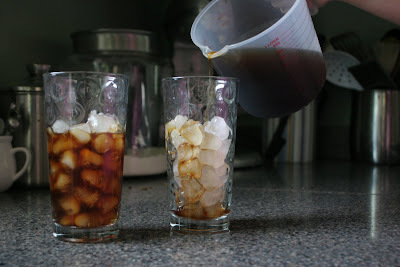 Then, once it's brewed, pour it over a lot of ice. Your whole cup should be filled to the top with ice. Store the rest in the fridge for about a day or two. Starbucks says 12 hours on the counter, but I think it can last longer than that. I am going to make this tonight! I think I will try to make it in my coffee press so in the am I can just just strain it with the push of a button. Thanks for the recipe! I just found your blog through Frugal Living NW. Your blog is amazing!!! I've already looked through several of your recipes, kid's crafts and projects. I just want to know, how do you find the time to do this and cook and create neat things with your kids? I'm amazed. Thanks for sharing and I'm definitely going to be doing some of the fun things from your site! I do this in my french press. (the cheap one I have from ikea) Just plunge it after its brewed overnight. YUM!! 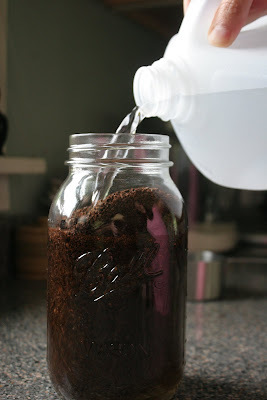 I'm a HUGE coffee drinker and can't wait to try this cold brew process...need to get some mason jars with lids!!! Thanks for posting....new follower here. I have been obsessing over making my own iced coffee this summer and it is never quite right. This sounds GREAT! Found you on MSM! I was so excited for this recipe! Cant wait to try it! Yum-o!! Makes me want to have a glass right now! Guess tomorrow I know what I'm doing . . . brewing up some cold coffee! Thanks for sharing (love the pic's too!). I am absolutely cracking up at all these posts!!! You hit the crave button for a lot of women!! Print the word "ice coffee" and we all want to run to the store and buy coffee and have it ground coarse!! Great post and great photographs, Travis! The Pioneer Woman (http://thepioneerwoman.com/) shows how to do this on a larger scale. All four in my family love iced coffee and we go through a lot of it. I actually make two gallons at a time in my big stock pot and filter it through an old white (well, not anymore!) tablecloth that wasn't being used anymore. Yummy! Thank you form showing how to do it on a smaller scale though - your readers will LOVE this coffee! I came here from Money Saving Mom. Read this post yesterday, went straight to the kitchen and made it. Got it out this morning, just had my first cup and came straight here to give you my undying thanks and adoration, lol! I have a feeling my husband will too as this may be the first thing that could make me give up my $4 coffee. It seriously is that good. That sounds great! I'm excited to try this out! Thanks. Ok this might be an obvious answer....but I only have a 1/2 quart jar. I want to make this NOW. Can I just use 1/2 cup grounds instead?? can you use already ground coffee like foldgers? I do this in my french press. 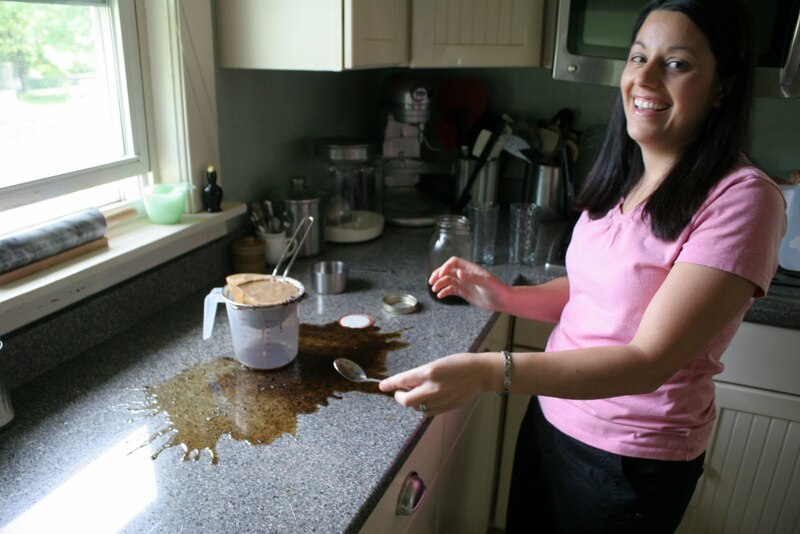 Just put the ground coffee & water in the french press and leave it out on the counter over night. Very easy!